CSIRO is helping enhance the adaptive capacity of rural communities in Indonesia’s Nusa Tengarra Barat Province, one of the world’s least developed regions. The islands of eastern Indonesia have some of the highest levels of poverty and food insecurity in the country. 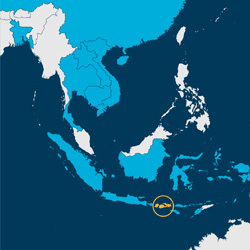 In 2009 Nusa Tenggara Barat had the second lowest Human Development Index among Indonesia’s 33 provinces, reflecting low levels of life expectancy, literacy rates, education and per capita income. Sixty-one per cent of rural sub-districts suffer chronic food insecurity, and the majority are in Lombok (World Food Program, 2010). Most people live in rural communities and derive their livelihoods from farming, fishing and small-scale local industries. They are highly vulnerable to changes in rainfall and weather patterns that could affect crop yields, livestock and fisheries. They are susceptible to natural disasters such as floods, drought and storms. These are becoming more frequent and intense as the global climate changes, exacerbated by population growth, fluctuating commodity prices and rising costs of living. Currently there is little information available to project the potential impacts of climate and other changes on rural communities, and no planning processes that can pro-actively anticipate them. Due to its regional importance, Indonesia is one of Australia’s largest partners in the aid program. This four-year collaborative project was led by CSIRO and the University of Mataram (UNRAM) and involved local and Australian partners. The project engaged provincial and local government, NGOs, businesses and communities to plan and test adaptation strategies that could enhance vulnerable communities’ incomes, while building the resilience of all stakeholders to long-term change and uncertainty. The project was intended to demonstrate an adaptation planning approach that could be scaled out in other rural regions of Indonesia. A novel participatory planning method was developed by researchers from the UNRAM and CSIRO, the Indonesian agencies for Agricultural Technology Assessment Agency and Meteorology which integrated the data, tools and facilitation skills necessary for adaptation planning. The method was successively applied and refined by the team through five sub-district case studies. Alternative bondre seaweed production that is more resilient to storms than traditional methods. On average this strategy could increase household welfare by $500-600 AUD per year, which is greater than the provincial GDP per capita. Inter-cropping of maize, castor and mung beans to increase productivity and reduce the risk of crop loss from variable weather. On average this strategy could increase household welfare by $300-400 AUD per year, roughly equivalent to the provincial GDP per capita. A Vulnerability Atlas of the Nusa Tenggara Barat (NTB) Province was produced by combining a livelihoods typology with projected impacts of climate change and population growth, and current adaptive capacity. The Vulnerability Atlas highlighted sub-districts where adaptation planning should be prioritised. The United Nations World Food Program has applied the atlas to guide their food security and resilience program, and has secured funding for the implementation of adaptation strategies. The atlas was also incorporated into the NTB Government’s Food and Nutrition Action Plan 2012, and the Strategy and Action Plan for Food Security and Climate Change. ‘No regrets’ adaptation strategies based on specific local needs. EcoRegions Indonesia (ERI) has adopted the adaptation strategies in one sub-district where they are implementing a new eco-tourism development that promotes local food security. The strategies are also being adopted and scaled-out through new partnerships between UNRAM, district governments and KPDT, promoting greater adaptive capacity in the most vulnerable households and communities in NTB. The Vulnerability Atlas of the Nusa Tenggara Barat (NTB) Province, this will help the government of Indonesia and the World Food Program (WFP) to identify sub-districts where adaptation planning and action should be prioritised. UNRAM is now better equipped to carry out integrated and multi-disciplinary research. The research team has become recognised among their peers, change agents and communities as champions of adaptation and gender research. This has resulted in team members being employed by WFP’s Climate Change Adaptation Program in Jakarta and ERI, facilitating the linkages between the project and these change agents. In this special issue, entitled ‘Climate Futures and Rural Livelihood Transformation in Eastern Indonesia’, we have written nine papers plus an editorial/synthesis, which describe the project’s approach, process, data, tools and evaluation. Each paper stands alone, but also links sequentially to other papers. A novel participatory planning method was developed that integrated the data, tools and facilitation skills necessary for adaptation planning. The method was successively applied and refined through five sub-district case studies. ‘No regrets’ adaptation strategies were developed with vulnerable communities, based on their specific local needs. Several have since been adopted, funded and scaled out by government agencies, the private sector and communities. A Vulnerability Atlas of the Nusa Tenggara Barat Province was produced, highlighting sub-districts where adaptation planning should be prioritised. The United Nations World Food Program has applied the atlas to guide their food security and resilience program, and has secured funding for the implementation of adaptation strategies.